If only “niceness” were a legitimate set of criteria for whether a theory is valid or not! String theory — or more accurately, the string hypothesis — goes back more than 40 years. 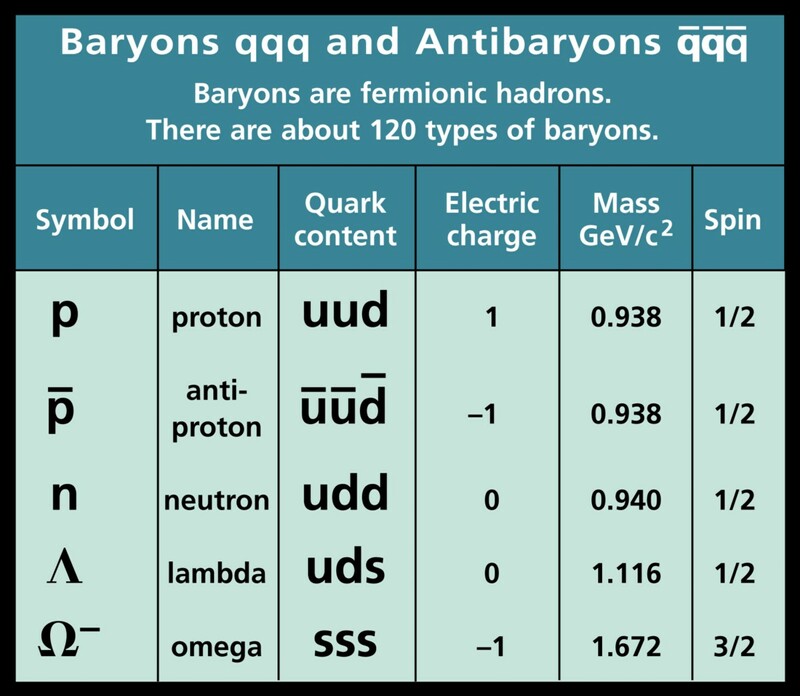 Back in the early 1970s, physicists were studying the new, unstable, high-energy particles produced at colliders: baryons (collection of three quarks), antibaryons (collections of three antiquarks) and mesons (quark-antiquark pairs). Images credit: CPEP / NSF / DOE / LBL, “Standard Model of Fundamental Particles and Interactions”. 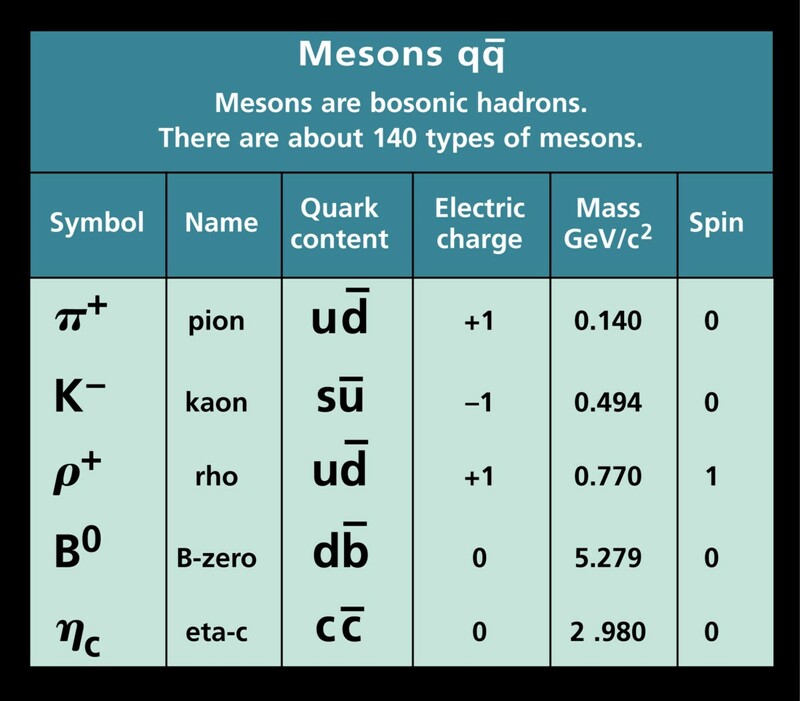 We didn’t know about quarks and antiquarks at the time for certain, but we did know that if you took a meson and tried to “stretch” it apart, at some point it would “break,” and produce two mesons instead of one. If you take a magnet — with north and south poles — and break it, you wind up with two magnets, each with a north and south pole. Well, mesons appear to work the same way, and that’s where the idea of the string hypothesis comes from. Images credit: Flip Tanedo of Quantum Diaries, via http://www.quantumdiaries.org/2010/10/22/qcd-and-confinement/. Rather than being made up of elementary, point-like particles, the idea was that everything would be made out of strings, either “open” (linear) strings or “closed” (loop-like) strings, vibrating at different frequencies. It turned out that this idea was all wrong for the interiors of baryons and mesons: its theoretical predictions, like the existence of new, spin-2 particles, weren’t borne out by experiment. The “string model” was discarded, as quantum chromodynamics (QCD) much better described the point-like particles found from deep, inelastic scattering inside of these entities. Image credit: Wikipedia / Wikimedia Commons user Qashqaiilove. But rather than having strings be important at ~MeV/GeV scales, where QCD effects dominate, it was realized that we could raise the energy scale for strings all the way up to (or near) the Planck scale: at around 10^19 GeV. The spin-2 particles that pop out could be gravitons, and all of a sudden, we’d unify not just the electromagnetic and weak forces, not just the strong force, too, but gravity. All of the forces we observed would be low-energy, broken symmetry versions of one, fundamental, overarching model: string theory. Image credit: Jeff Bryant from Wolfram/Mathematica. So that’s the idea. So far, all of its predictions of what should be potentially observable in our Universe — supersymmetry, extra dimensions, new particles, new decays — have failed to be borne out. Every observation is consistent with null results: no string theory. But perhaps there are clever ways to discover a way that string theory could result in an observable effect that isn’t predicted by standard physics in the real Universe. Images credit: Perimeter Institute’s Public Lecture series. 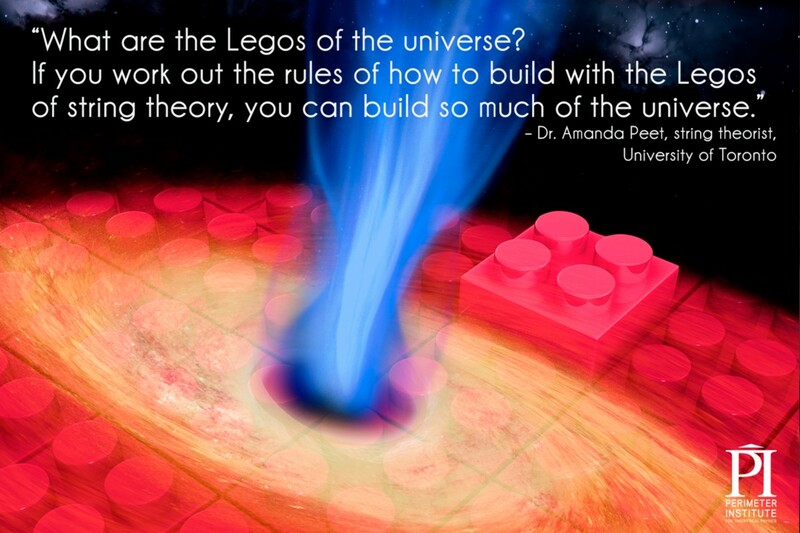 Later today — at 7 PM EDT / 4 PM PDT — Perimeter Institute, as part of their lecture series, will be broadcasting the talk of Dr. Amanda Peet on the topic of String Theory Legos For Black Holes. The talk promises to discuss paradoxes related to black holes, and the information paradox in particular, and how String Theory may provide an avenue for its resolution. Despite my status as a skeptic that string theory is relevant for our Universe — I did, after all, write that it’s already dead — I’m optimistic that this talk will have a connection to observables, and a way to validate or falsify some aspects of this vaunted idea. So, how to watch and experience this talk? Live, with a live blog by me, following along in real-time, of course! and then I’ll be live-blogging Dr. Peet’s talk just as I have two others from Perimeter in the past. Open this page in a new tab or window so you can keep reloading, and follow along. I can’t wait, and hope to see you there! 3:54 PM — Let’s begin the live blog! To get you excited, have a listen to Dr. Peet’s excitement about exploring the nature of physics itself. Why do the fundamental laws and constants exist as they do? How did they give rise to the Universe we have today? These are among the greatest of questions, and I adore Dr. Peet’s desire to find it all out! Image credit: Randall Munroe of xkcd, via https://xkcd.com/171/. 3:59 PM — And let’s just get the you-know-what jokes out of the way. Images credit: I can has cheezburger. 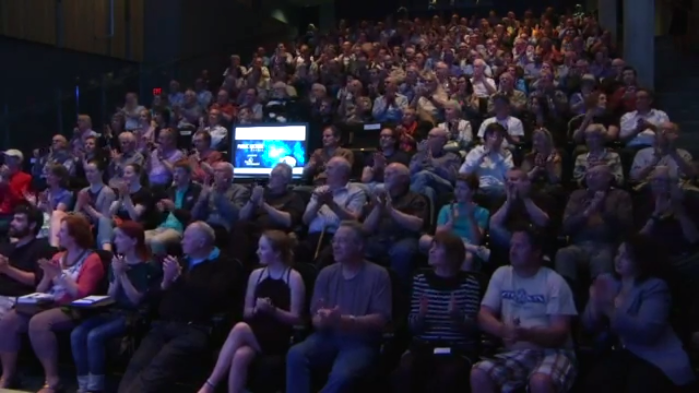 4:01 PM — Okay, and if you’ve never seen a shot of the inside of the Perimeter Institute auditorium, here’s one: it’s packed! 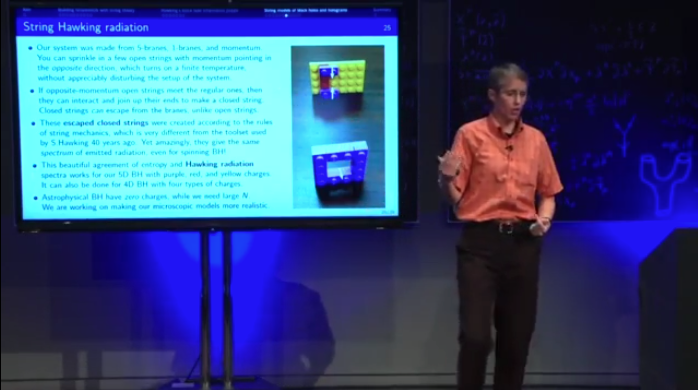 Image credit: screenshot from the perimeter institute live stream. 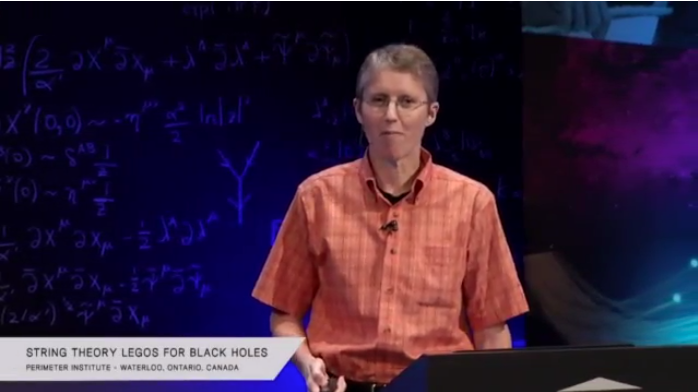 4:04 PM — Dr. Peet says something I really liked just to start: here are the two things she’s very interested in — string theory and black holes — because they represent, in many ways, the possible testing ground for string theory. After all, if you want to go beyond General Relativity for gravitation, you need to go to the places where classical (non-quantum) physics breaks down. For gravity, that means you need a singularity. And to get that, you need to go to the center of a black hole: that’s the one place you can go that you know is real, and even (somewhat) accessible, and truly find a place where quantum gravitational — and hence, string theoretical — effects may be important. 4:07 PM — I also like how Dr. Peet lays out the three different types of physics when it comes to probing string theory: experimental, theoretical, and computational. Dr. Peet just owns that they’re a theorist, like me. In astronomy, by the way, the three are: theoretical, observational and instrumentational. “Computational” is just a subset of both theoretical and observational in astronomy/astrophysics, while computational — in particle physics — is often a very important part of what we call phenomenology, which is where theory intersects with potentially experimental observables. 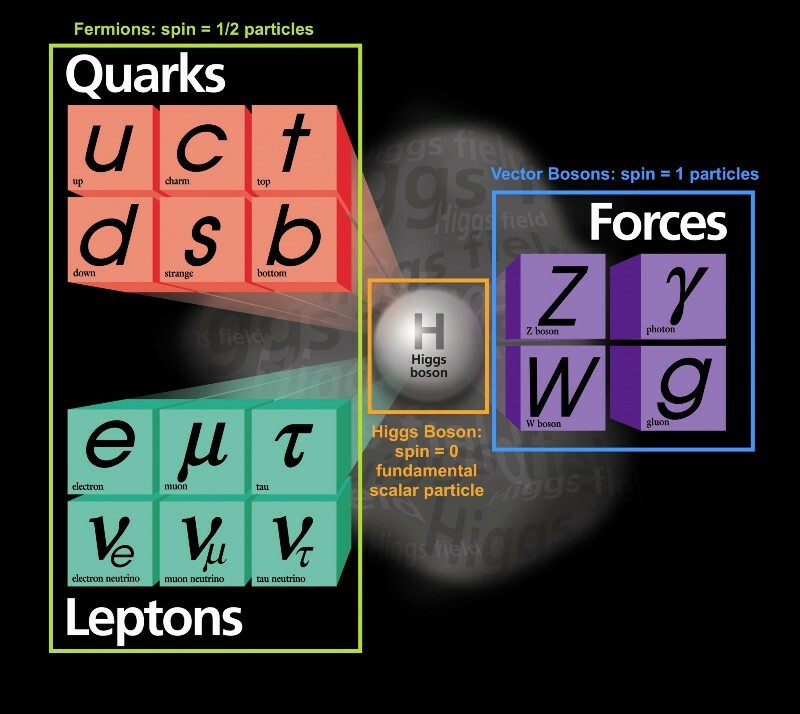 4:10 PM — if you want a different “picture” of the fundamental particles, I recommend this image, that breaks them down in a much more accessible form than the beanie-baby-style toys that Particle Zoo makes. Image credit: Fermilab, modified by E. Siegel. 4:15 PM — Dr. Peet says something important: what evidence do we have that these “fundamental particles” are point-like, rather than having some non-zero-dimensional structure? Image credit: Einstein light, via http://www.phys.unsw.edu.au/einsteinlight. But think hard about this: the LHC can get down to about 10^-20 m, which is tiny, about 1/100,000th the size of a proton. 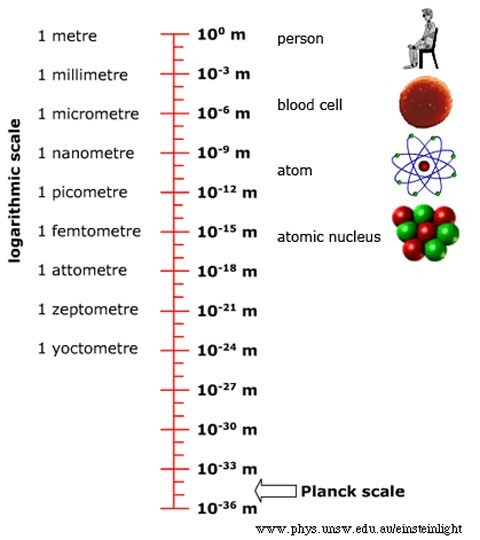 But if the string scale is smaller than this — and it could be as small as 10^-35 m — we wouldn’t know until we get all the way up to that energy scale: possibly 10^14 times higher than the LHC can reach. It’s possible, regardless of what our sensibilities say. 4:18 PM — this is important: you can, in string theory, get a spin-2 particle. You can also get spin-1 particles (photons, gluons, W-and-Z bosons) and spin-0 particles (Higgs boson). Dr. Peet didn’t mention it, but you can have fermionic (spin-1/2) particles in there as well. Pierre Ramond, a physicist at University of Florida (and one of my old profs as a grad student) was the person who discovered that. This is true, but this tongue-in-cheek remark belies the difficulty I have with string theory at the moment: it needs to do more than make postdictions, it needs to make real predictions of new, observable phenomena. Otherwise, it’s just a pretty, fun idea. 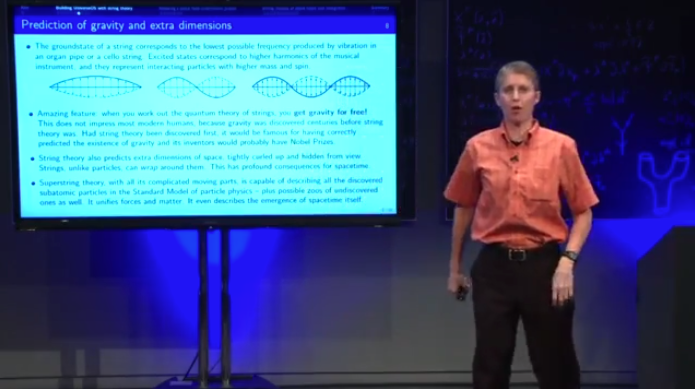 4:23 PM — Dr. Peet says something very important: string theory allows you to build a better theory of gravity than standard particle physics does. The amazing thing — and this is a little deep — is that “standard particle physics” gives you no theory of gravity at all. You get nothing! 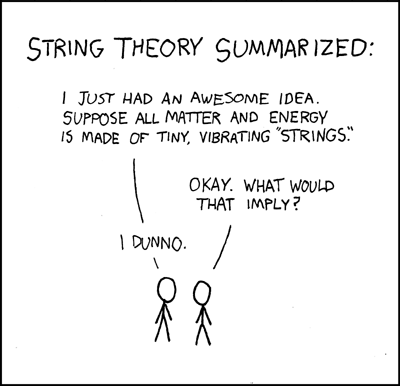 What does String Theory give you? Well, it gives you something. It gives you a 10-dimensional Brans-Dicke (scalar-tensor) theory of gravity out. If you take six of those dimensions away and take the scalar term away — both necessary to agree with observations — you can get Einstein’s General Relativity. It has problems, but again: it’s possible. 4:28 PM — You need to make a model to describe reality. You don’t need to go past known physics to understand this. I want you to think about how hard it is to calculate something in General Relativity. Did you ever do one? Well, if you took physics in high school or college, you probably calculated the force between two objects using Newton’s gravitational law. Have you ever done it using Einstein’s equations? Image credit: retrieved via http://quantum-bits.org/?p=116. My guess is no, because you can’t. If you want your spacetime empty, that’s easy. That’s special relativity. Want to put one point mass in there? No problem: it took a month for Karl Schwarzschild to derive that solution. Want two point masses? That’s impossible, and so all we can do is make approximations and models. 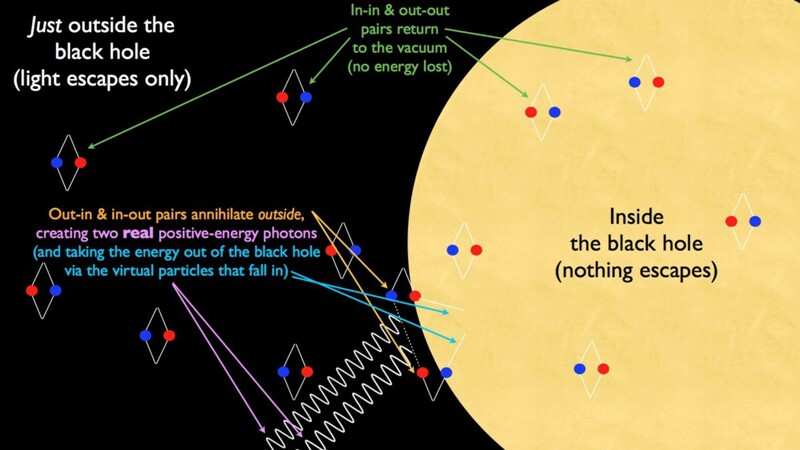 4:33 PM — black holes emit radiation! This is (IMO) Hawking’s biggest (and really, his only major) contribution to astrophysics. It’s just thermal radiation, however, with a blackbody spectrum. You can compute this by calculating the appropriate quantum field theory in the curved spacetime at/near the event horizon of the black hole. The problem is — and the information paradox arises — when you consider that the stuff that fell in had real information: conserved quantum numbers. Things like charge, color charge, mass, baryon number, lepton number, lepton family number, spin, etc. 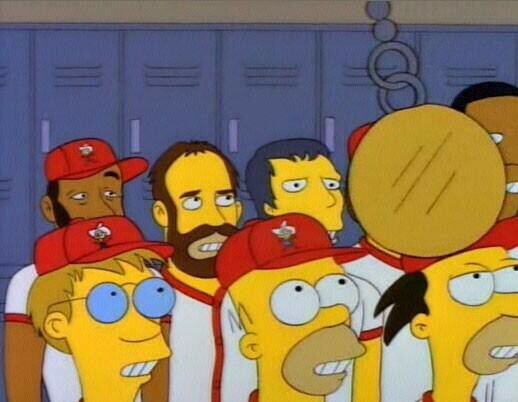 But the radiation that comes out eats that information. So does it get destroyed? What does that mean for entropy/thermodynamics? Image credit: the admin of the Language of Desire, via http://languageofdesirex.com/stop-fighting-save-relationship/. but the real problem is that General Relativity is — as Dr. Peet states — a theory of the very massive while quantum mechanics is a theory of the very small. What do we do when we get something that’s very massive on a very small scale? Well… we don’t know. 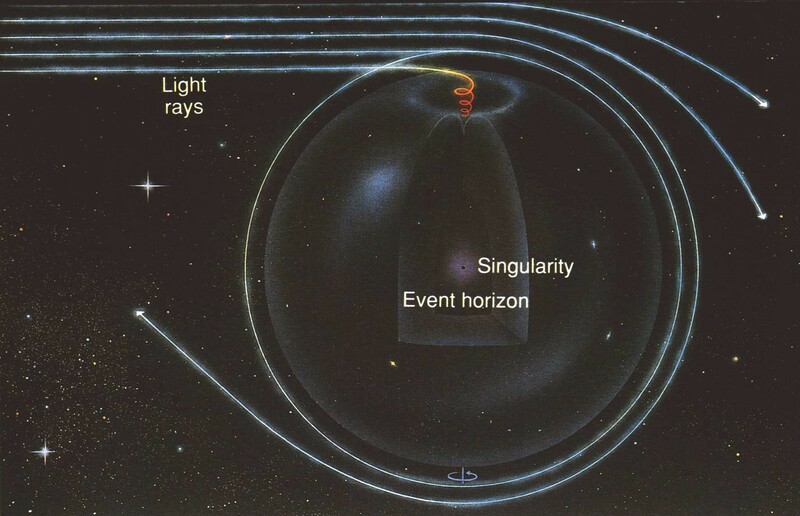 We get “singularities” or things that don’t make sense: infinite densities, and answers that are either infinite or infinitesimal to quantities that must be finite. So what do we need? 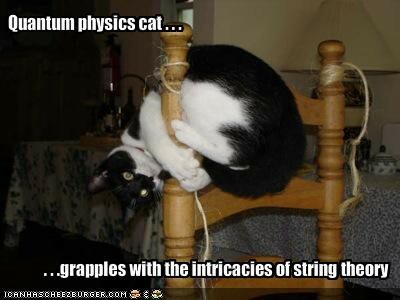 Realistically, a quantum theory of gravity. String theory, right now, may be the only viable candidate. 4:41 PM — Dr. Peet says that probability needs to be between 0% and 100%. I wonder if they’ve ever felt the need to give 110%? 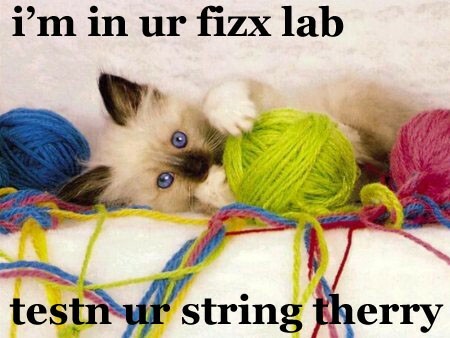 4:45 PM — So what do you have in string theory? Well, you can have open strings, closed strings, and couplings. You can also have open strings with endpoints (it’s kind of important), and they end on 2-dimensional surfaces: branes. 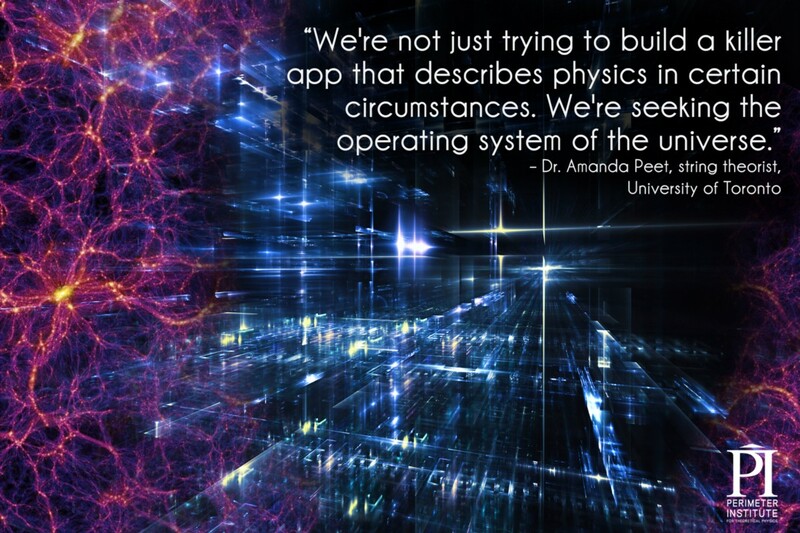 Image credit: screenshot from Perimeter Institute talk. You may then ask: what about where the branes end? Do they need 3-dimensional “surfaces” to latch onto? Well, if they’re “open” branes, then yes. 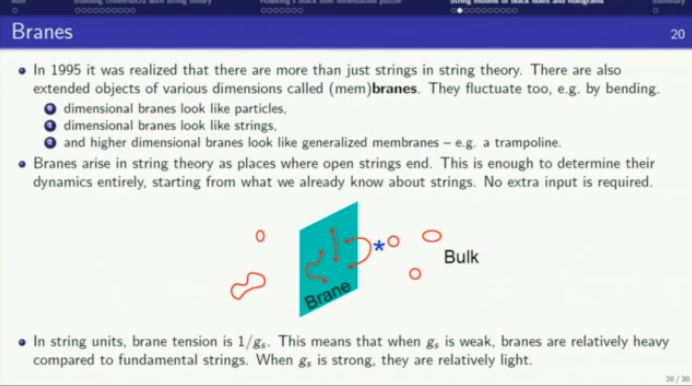 What about those 3-branes? You see where this is going, and your answer is yes, your worst fears come true. 4:48 PM — Now, we get into the problem: the quantitative work. How do we get a Universe that’s consistent with our Universe? If we want to start from String Theory ingredients, what do we need to do to get a Universe like ours? Image credit: screenshot from Dr. Peet’s talk. You need a huge number of branes, as well as — something Dr. Peet didn’t mention — very specific couplings and vacuum expectation values. Where do those values come from? Well… you have to choose them. String theory doesn’t give you a mechanism that picks them for you. It seems — to me, I’ll state — that you’ve traded one hard problem for at least another hard problem, and possibly a much harder one. 4:52 PM — But you can build a black hole that carries momentum, a “one-brane” charge, and a “five-brane” charge. Keep in mind, by the way, that not all black holes need to have point-like singularities at the center. Spinning black holes, for example, have singularities that look like one-dimensional rings. Surprised we don’t have a mention of a “one-brane” being interesting for that! 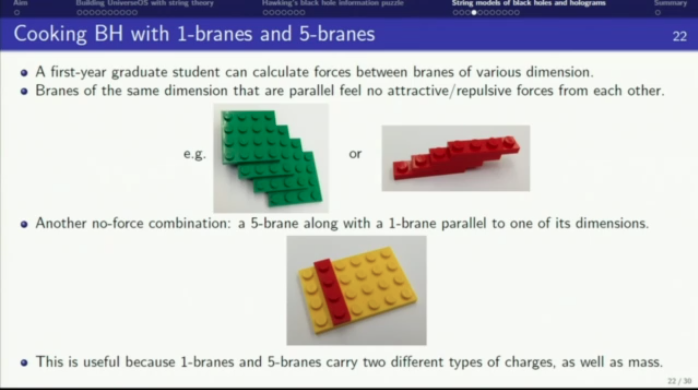 4:55 PM — Can the LEGO analogy Dr. Peet’s using explain Hawking radiation? Yes, but they’re the LEGOs that you always step on when you walk to the bathroom in the middle of the night. 4:57 PM — Now, onto the idea of a hologram. 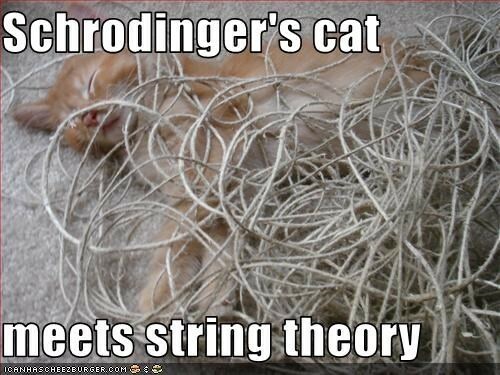 String theory, as Dr. Peet has said, has more dimensions than our Universe appears to have, and this is a bad thing. But perhaps our Universe could be what appears to be a three-spatial-dimension space that has many more dimensions, just like holograms are actually two dimensional, but encode our three-dimensional Universe’s information. Image credit: Matthew Brand, via http://www.fastcodesign.com/1671667/hypnotic-gifs-of-a-newly-invented-type-of-hologram. Dr. Peet’s doing a good job explaining this idea. 5:01 PM — what Dr. Peet is talking about, for holograms, is known as the AdS/CfT correspondence, which shows that our four dimensional (3 space + 1 time) spacetime — the “conformal field theory” — is mathematically equivalent to a five dimensional anti-de Sitter spacetime. That’s interesting! But it’s also troubling… because string theory needs ten (or 11) dimensions, not five, and because our Universe has a positive cosmological constant for dark energy, not the negative one that comes with anti-de Sitter spacetime. 5:03 PM — Gotta give credit for an on-time start and an on-time end. Even though there was no connection to observables, it was a very interesting talk. 5:05 PM — The problem, as asked in the Q&A with the holographic principle, is that we can only go down one dimension. Can we go from a 1o-or-11 dimensional spacetime down to our 4 dimensional Universe? That’s unknown. 5:08 PM — Is string theory falsifiable? Is it science? Can it be “proven”? Can our theory explain most things that we see? Can it predict new things that we see? Here’s the fun thing: it can be falsifiable. You can find, for example, no supersymmetry at all scales, and that would falsify it. Image credit: DESY at Hamburg. Unfortunately, Dr. Peet isn’t making a compelling case that string theory can be validated in any way, or that it can make a new prediction that we can test. 5:11 PM — I wish Dr. Peet would talk about what experiments (or what observational signatures) would, for example, invalidate string theory, as part of their answer. 5:13 PM — Thanks for a great talk, Dr. Peet, thanks to Perimeter for offering to let me host and to do this live blog, and thanks to you for attending! Hope you enjoyed it! What Do You Need to Learn Upper Level Physics?